County Commissioners are elected to six year terms, on a rotating basis; with one Commissioner position elected every two years. 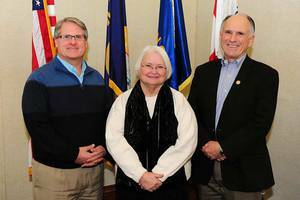 The Commissioners are responsible for exercising the County's administrative, executive, and legislative powers as outlined in the Montana State Constitution and state statutes. This includes appointment of department heads and members of supervisory boards and committees. The Commission supervises the administration of County government; approves the County budget; levies taxes; issues bonds; investigates claims against the County; administers subdivision review and approval; and supervises road and bridge construction and maintenance. The Commissioners set policy for County government, represent the County, maintain County property, invest County funds, and authorize and sign all contracts obligating the County. The Commissioners are charged with the duties of managing the business and concerns of the County in the best interest of the residents and performing all acts and duties, as required by law, necessary to fully discharge the duties and responsibilities of County government.